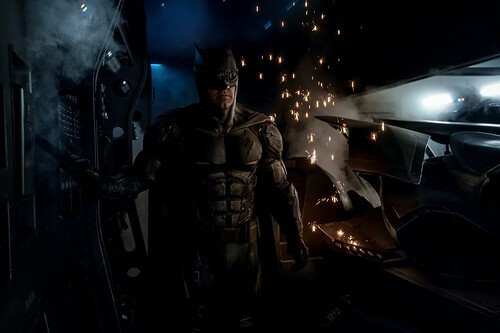 Zack Snyder has revealed Batman in the new Tactical Batsuit for the upcoming Justice League movie. Homestretch. Last day filming Batman in the new Tactical Batsuit. Click on the Headline for a Higher Resolution version of the Image. looks like something out of a videogame. 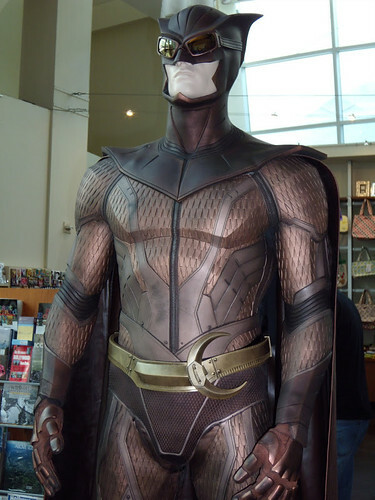 The mask is almost an exact copy of the mask Night Owl wears in Watchmen. So, that must be intentional. Not a fan of the headgear, the eyes look completely out of place on a Batman outfit. He kinda looks like a dog, honestly, like a doberman or something. As for the suit itself, I guess it look alright. At some point though, I'd like to see them make a live action version of Batman from the Animated Series, one where he focuses on acrobatics and avoiding bullets, rather than face-tanking them with loads of armor. It's realistic and practical, I get it, but I think they make something more interesting than Iron(Bat)Man. I prefer my Batman to have at least a bit of armor, even it it's covered with grey cloth/material. Even as a kid, I hated the idea of him just wearing cloth, especially when he's taking on guys with guns. Sure, I can agree with that. His suit in the first two Arkham games pretty much fits the bill, but I guess they're trying to do away with the spandex look altogether. I think they need to tone down the armor just a tiny bit though. Looks pretty good but whey does the suit need such as profound sick pack? Almost looks like a tractor tire. Well, they did; the BvS suit was essentially what I just described. I doubt he'll be wearing this particular suit for most of the movie. Even if he does, I'd be willing to bet they transition back to the black-and-grey ensemble for future films.